Giveaway: A Painting in the Post! As children, our grand plan was to one day create books for kids, together. We'll get to that. What has turned out to be our first joint venture is Paintings in the Post ... a blog sparked by Heidi's decision to embark on a daily painting project. As I write, she's just completed Day #46 and shows no sign of slowing down! Are you inspired? I know I am. Did I mention she also has two school-aged children?? Anyway, her entire beautiful (and growing!) collection of daily paintings is now for sale through Paintings in the Post. Why the "post" part? Because Heidi is also a lover of "good-old-fashioned" letter writing. When she ships her little beauties around the world, they are accompanied by hand-written letters. See all the stamps on the envelope below? Your painting will be coming to you from Durban, South Africa. In celebration of her launch of Paintings in the Post, Heidi is excited to give one of you lovely people a painting of your choice! 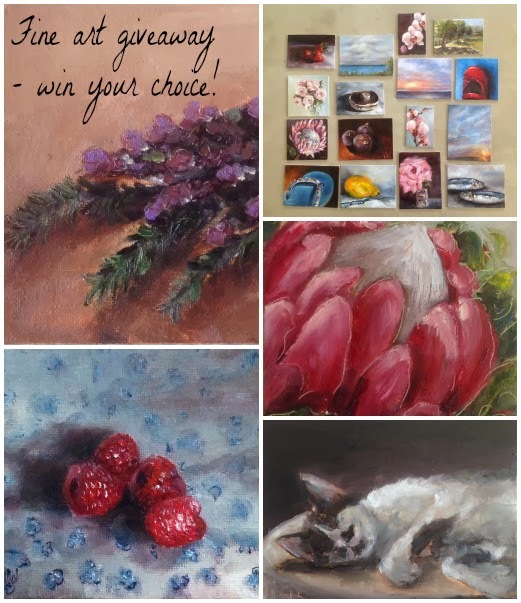 There are lots of ways to enter (through the Rafflecopter entry below) but please note: Only paintings still for sale are available to win (they include a Buy Now button). These are one-of-a-kind oils on primed, canvas board worth approx $80. If you see SOLD under an image, the painting is gone. Giveaway opens 12:01am EST Thurs, 11/14 and ends Mon, 11/18 at midnight. WINNER announced Tuesday 11/19. 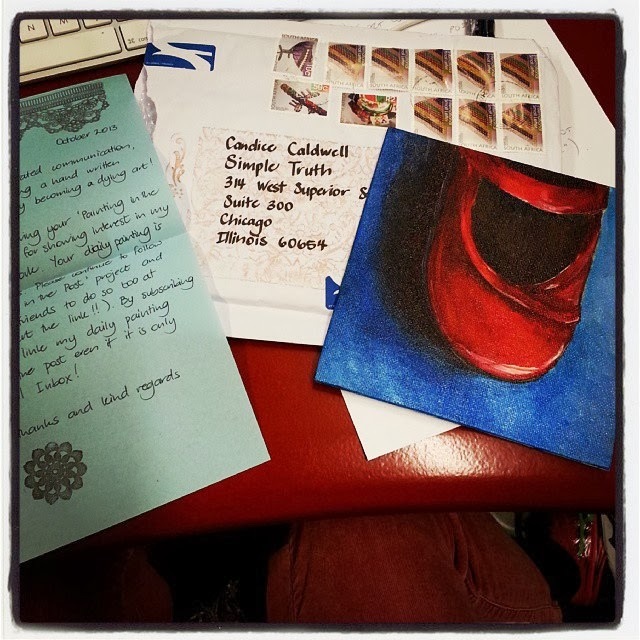 Open to citizens of the world, 18 and older - if you can get post, you can win a painting.